Rakshasas are some of the most sinister villains Dungeons and Dragons has to offer. Now, I admit I’m a cat lover, but they’ve won that title fair and square. They’ll win you over, too. Or just eat you. I doubt they care very much one way or the other. Sure, the rakshasa has been around since the very first edition of Dungeons and Dragons, added by Gary Gygax himself after inspiration struck in the form of a 70s tv show called Kolchak, Night Stalker. But rakshasas are much older than supernatural crime shows — the name and the myth comes from Hindu mythology. Often translated to English simply as “demons,” the original rakshasas were legendary shapeshifters who treated outsiders with violent antagonism. Though unkind to humans, they were said to treat each other well and lived in a breathtaking city designed by the architect of the gods. Active at night, they also avoided moonlight and favored the new moon. They were considered lustful, with no regard for others’ marriages. Dungeons and Dragons clearly draws from some aspects of this mythos. In the game, rakshasas are most formidable because of their shapeshifting powers. Naturally, they also excel at stealth and magic. However, while mythological rakshasas do not necessarily have a single true form, their Dungeons and Dragons counterparts do: a humanoid tiger figure, standing on its back legs, with its hands on backwards. If you’re having trouble visualizing that, imagine my hands on the keyboard, typing this blog post right now. My thumbs are in the middle, right? Back of the hands facing up? Seems pretty normal? A rakshasa in the same position would be looking down at their palms. Their thumbs would be on the outside. If those poor suckers wanted to type, they’d have to twist their arms around — squeezing their elbows into the middle of their chest or locking them in a straight line. This, obviously, must be the reason that rakshasas are incredibly power-hungry. They need secretaries. No, really, though. Lust for power and wealth are some of a rakshasa’s defining traits. Like tigers, they’re solitary and predatory. They don’t like to share power with other rakshasas, so they rarely work together, opting instead to impersonate royals, politicians, or influential merchants. Oh, and they have a taste for human flesh. So… creepy, cannibalistic boss monsters. Was that not enough? Because, when you kill them, they’re reborn in the Nine Hells. They’ll remember everything about their past life — especially that part where you killed them. And they will come for you. The only way to kill a rakshasa permanently is to do it in the Nine Hells. Which, I don’t know about you, but that’s not topping my list of vacation getaway spots. Mythological rakshasas differ from the DnD monsters in a few ways beyond that weird hand thing, though. For one, the DnD monsters are extremely intelligent and, according to the 5th edition Monster Manual, favor “delicacy and misdirection” to complete their schemes. That’s not to say that the rakshasas of myth are stupid! But their methodology may be different. What do I mean? Just take a look at those classy mofos up at the top. 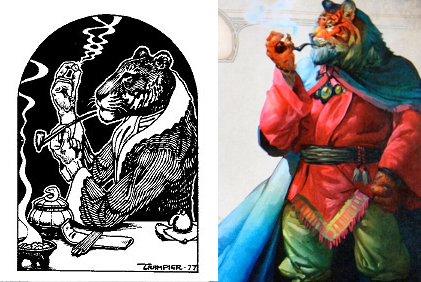 From the beginning, for whatever reason, DnD rakshasas have frequently been depicted smoking pipes. Why? Probably just because they can. But, like, you can just see that guy puffing out a smoke ring and calling you “old sport,” probably in a British accent, right? I mean, now I’m thinking maybe that Moriarty guy — did anybody ever check that his hands were screwed on the right way? My point is, those guys look posh. They’re drawn in a way that Western iconography has coded to look posh. And think about the scheming nature that the Monster Manual emphasizes. They’re drawn to power, so it would naturally make sense that they need a society with built-in power structures to manipulate. The battle between Rama and Ravana is not about good and evil but about culture and nature. In Rama’s world the weak are protected by the strong. In Ravana’s world there is no room for the weak. This is part of his larger argument that, because British colonialists used Western religion to build their understanding of Hindu tradition, they forced Biblical notions of good and evil onto entities that were originally morally grey. He refutes the Western understanding of rakshasas as intentionally evil, instead describing them as self-interested beings whose actions were not usually in humans’ best interests. Clearly, with their Lawful Evil alignment, DnD rakshasas hew closely to that Western view. Plus, the posh rakshasa scheming their way through complicated social power structures all Game of Thrones-like is very different from the “Might is right” style law of the jungle. Another place DnD lore breaks significantly from the source mythology? In 4th edition DnD, rakshasas are linked to a playable character race called devas. Devas and rakshasas are drawn as counterparts — devas are heavenly and good-aligned, rakshasas are from the Nine Hells and evil, both reincarnate, and devas who become corrupt reincarnate as rakshasas. Except, in Hindu mythology, the devas already have a thematic foil, and it’s not the rakshasas. Here’s how it works: the devas, usually translated as “gods,” live in the sky and use their powers to coax natural resources out of the earth. Their counterparts, called the asuras — which generally translates as “demons,” just like rakshasa — live underground and draw natural resources back into the ground. That tends to irritate humans, hence the negative connotation, but it’s part of a cycle of life, not an act of malevolence. So, 4th edition basically conflates the rakshasas with the asuras. I notice this bit of lore has not made it into 5th edition — at least, not yet — so it seems like they’re back to their old, slightly more historically accurate selves. As historically accurate as a shapeshifting demon gets. Well, that’s about it for the DnD version of rakshasas. If “sorcerer” and “assassin” and “incorrigible flesh-eating fop” didn’t earn them a place on your top shelf of monsters, then I don’t know what will. Got a good rakshasa story to tell from your gaming table? Something to add from the mythological side of things? Know the origin of the mysterious backwards hands? Leave a comment, we’re dying to know. My group play tested some new classes for Pathfinder a little over two years ago and we were hunting down this Cult of the destroyer for a new Emperor, selected by his advisor. We thought we were getting leads and were really close to rooting out the cult when we got explicit instructions to cease our search from our benefactor, the royal advisor. It turns out that we actually had managed to find out very little salient information but in our search had alerted a semi involved Rakshasa to the investigation, which led to him murdering and trying to replace our friend. We were able to discover the switch and slay the Rakshasa but it left lost on how to hunt the cult, without an employer to pay us, and with a sense that we had likely destroyed the best hope for the country with involving the advisor. Yikes! Just goes to show how a good rakshasa can leave you totally screwed even if you manage to win the battle.